The online retail giant also said first-quarter sales climbed 15 percent. The company lost money in the quarter, compared with a year-ago profit. Investors finally got a look at the financials of Amazon.com’s cloud-computing business, Amazon Web Services, and they seemed to like what they saw. As part of its first-quarter earnings report Thursday, the Seattle-based online-retail giant offered details for the first time about AWS, the division that rents computing and storage to other businesses. The company disclosed AWS rang up $4.6 billion in sales in 2014. 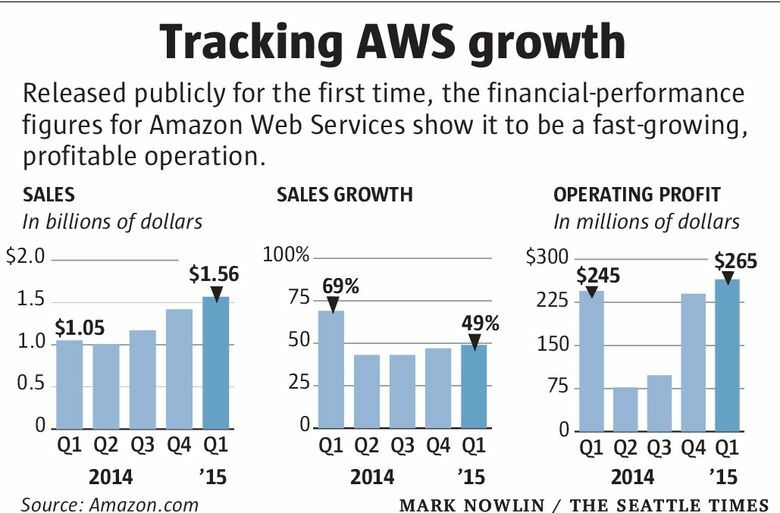 Maybe more impressive, the company said AWS sales grew 49 percent to $1.6 billion in the first quarter of 2015. AWS is Amazon’s 9-year-old business that sells infrastructure technology as a service over the Internet. Rather than owning their own computer servers, companies rent computing resources from AWS to cut cost and complexity. It’s a business that Amazon pioneered and currently dominates. Its customers include startups such as Pinterest and Airbnb, established corporate giants such as Nike and Merck, and even government operations such as the Central Intelligence Agency. “Amazon Web Services is a $5 billion business and still growing fast — in fact it’s accelerating,” Amazon founder and Chief Executive Jeff Bezos said in a statement. Just as striking, AWS’ operating profit climbed 7.5 percent to $265 million in the quarter. That’s a 16.9 percent operating profit margin, a huge number for a company that routinely posts slim margins, and often losses, for its overall business. Amazon, which has always been parsimonious in its financial disclosure, was required to reveal the AWS data because the unit had become a “material” piece of its overall business by accounting standards. The fresh AWS details helped send Amazon’s shares soaring in after-hours trading. The stock, which closed regular trading Thursday at $389.99, up 19 cents, jumped nearly 7 percent after the market closed to $416.50. If shares maintain that price when the market opens on Friday, it would be an all-time high for the stock. The AWS disclosure came in the company’s release of first-quarter financial results. For the quarter, Amazon sales jumped 15 percent to $22.7 billion. The company lost $57 million, or 12 cents per diluted share. In the year-earlier period, Amazon earned a $108 million profit, or 23 cents per diluted share. Analysts expected Amazon to lose 12 cents a share on sales of $22.4 billion, according to an average of estimates Bloomberg compiled. 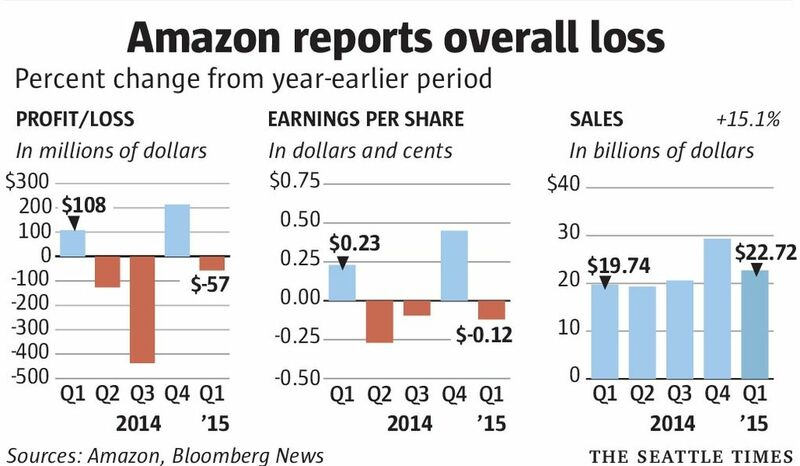 Amazon’s results took a big hit, $1.3 billion, from foreign-exchange rates, the result of a strong U.S. dollar. Excluding the impact from foreign-exchange rates, Amazon said its sales increased 22 percent, compared with the first quarter of 2014. Tough exchange rates pushed international sales down 2 percent in the quarter to $7.7 billion. Operating loss for Amazon’s international business more than doubled to $76 million, from an operating loss of $33 million a year ago. The toughest spot for Amazon’s international business came in media sales, which includes books, music, movies and video games, as well as digital downloads. That segment fell 12 percent to $2.3 billion. Despite the slowdown in international sales, Amazon Chief Financial Officer Tom Szkutak was particularly bullish on India in a conference call with financial analysts. Amazon has said it plans to invest $2 billion in the country, and the company highlighted new services it debuted in the quarter to help sellers there update inventory and deliver items quickly. But the new data about AWS is what investors are likely to scour. The company revealed quarter-by-quarter sales and operating profits since the beginning of 2014. That data showed a dip in operating margins for the second and third quarters of last year. In March 2014, Amazon was drawn into a price war with companies such as Cisco Systems and Google, each seeking to cut into AWS’ sizable market-share lead. In a call with journalists Thursday, Szkutak said those lower margins, 7.7 percent in the second quarter and 8.4 percent in the third quarter, were the result of the price cuts coupled with investments in computing infrastructure and other resources to run the business. Amazon also disclosed that AWS’ assets, which include property and equipment and accounts receivable, total nearly $7 billion. That includes $4.3 billion in property and equipment Amazon added to AWS in 2014. “We’re deploying a lot of capital in that business because we like what we see,” Szkutak said. Amazon also forecast its second-quarter financial results. It expects to generate between $20.6 billion and $22.8 billion in sales, which would represent growth of 7 percent to 18 percent. The company expects to post operating results somewhere between a $500 million loss and a $50 million profit, compared with a $15 million operating loss a year ago. One area where Amazon continues to grow is in employees. At the end of the quarter, Amazon had 165,000 full-time and part-time workers worldwide, excluding contractors and temporary personnel. Jay Greene: 206-464-2231 or jgreene@seattletimes.com. Twitter @greene7.